This station is the second train station in Harpenden and it was built back in 1868 by Midland Railway. Sadly, there are no remains of the original station, Harpenden East. Given that many people think that Harpenden is a very important commuter town, it is easy to see why the local train station plays a big part in people's lives. Harpenden Railway Station is found on the Midland Main Line and is located on the Thameslink route, with the station itself being managed by Thameslink. This station is the second train station in Harpenden and it was built back in 1868 by Midland Railway. Sadly, there are no remains of the original station, Harpenden East. While the current railway station is located on Station Road, the road got its name from the initial station, as opposed to the current incumbent. A branch line was added in the late 1870s and in the 1880s, a south curve was put in place at the junction and this enables passengers to travel to London directly from Harpenden rather than joining at Luton. However, this branch was closed down in 1964 and this route is currently utilised as a cycleway, making its way beneath the M1. There are a number of retail outlets at Harpenden Railway Station In the run-up to the station, there were five brick build coal merchant’s offices but these are now used as office units and retail outlets. While Harpenden Railway Station is a rather modest station, it is able to provide toilets, there is a newsagent, there is a dry cleaning service, there is a taxi rank and office and there is also a coffee shop. The dry cleaning outlet provides a fantastic service for people in the local community, allowing people to drop off cleaning on their way to work and then being able to collect these after work on their way home. The station is also served by ticket machines which are located at either side of the station. Harpenden Station is served by a PlusBus scheme which enable passengers to save money on train and bus tickets. However, given the importance of arriving on time for the next train, many people end up booking a taxi to travel to and from Harpenden Railway Station. There are four platforms in Harpenden Railway Station and these platforms have all been extended. 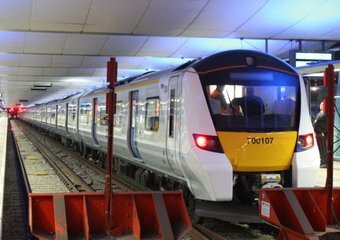 This was to ensure that they can support the 12 carriage trains utilised by the Thameslink programme. Other improvements undertaken at the station in recent times include a widening of the road bridge and the construction of a footbridge which provides disabled access to all of the platforms. The eastern side of the station, which is Platform 1, has two ticket gates to help ease congestion during busy periods while the western side, which is where the ticket office is located, also has ticket machines. Future extension and development plans for the station include creating more parking spaces. This will be achieved by adding to the existing car park on the east side and when this is complete, Harpenden Railway Station will be able to accommodate an additional 200 parking spaces. Harpenden Railway Station is a fitting station for a modern commuter town.